The book description is what intrigued me enough to pick up this read which is a little out of the ordinary from the usual fare I read. I’m glad I took a chance on it! Seventeen-year-old Grace Michaels is determined to be thin, even if she dies trying. Part of the in-crowd at Providence High, she is steps away from being asked out by the most desired guy at school, winning a prom queen nomination, and her parents’ approval. If she can just get skinny enough, be pretty enough, and popular enough. But Grace is thin on the outside and fat on the inside. No amount of weight-loss ever seems enough. Convinced the melting pounds will solve her problems, every pound lost brings her closer to her goals. But flesh and bone can only hide the weight of her secret for so long. 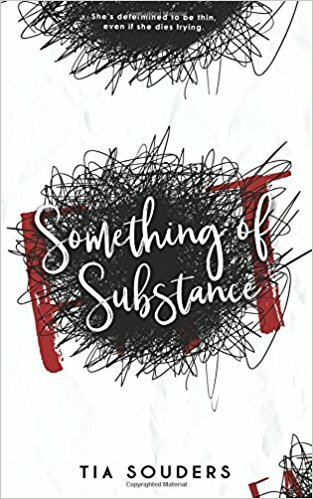 Fans of the emotional and thought-provoking contemporary YA fiction, such as Before I Fall, Tell Me Three Things, and All The Bright Places will fall in love with Souder’s heart-wrenching novel, SOMETHING OF SUBSTANCE. This book follows the story of Grace, a seventeen-year-old high schooler that was heavier last year, but after a summer ‘fat’-camp is now finally at her goal weight, and part of the in-crowd at school. Convinced that she needs to up her game to be more popular, catch the eye of the hot guy in school, and finally get the attention she so craves from her parents, she decides losing more weight is the way to go. The more she loses, the more in control she feels. Sadly, she loses sight of how out of control everything around her is falling. I must admit that the first couple of chapters I had to push myself to continue. So much was focused on the food and calorie count, almost a droning on of her inner dialogue. Once I got past that, I got lost in the inner working of her twisted mind, and I could so see how Grace was going through what she was going through. I as a woman, and once a teenage girl, understand the struggle we as females today face to look good, fit in. It seems like at some point or another (maybe for some even a constant) we battle the image we feel we need to achieve to be the best version of ourselves. This book takes you along on the journey of an anorexic girl, who ultimately believes that starving herself will solve all of the issues in her life. That voice that we all hear sometimes telling us we aren’t good enough, pretty enough, skinny enough, that voice got the upper hand here. And it is painful yet unstoppable to read it. I struggled reading Grace’s story, even shedding a tear somewhere in there, but I felt compelled to power on and see where this book would take me. On the romance side of this book, very early on in I figured out who the real hero and love interest would be. And he is AMAZING! It just comes to show how important it is to love someone that is your closest friend. What for me was a little down side to the book, was Grace’s recovery. Having gone on the whole journey with all the characters I felt like when we finally faced the moment of Grace being pieced together again, it could have been more than a lengthy epilogue. But that is just my opinion. In all, this book was very thought provoking, and left me with a mayor book funk after finishing the last page. I’ll be sure to look out for more by Miss Souders. Tia Souders is the author of bestselling women’s fiction novel Waiting On Hope and the upcoming award-winning young adult novel Better Than This (formerly titled Freedom Road). When she isn’t writing, she’s likely renovating their century home. She’s a wine-loving, coffeeholic with a sweet tooth and resides on a farm in rural Ohio with her husband and children. Sounds good. Thanks for the review. I love learning about new books, and this intrigues me.